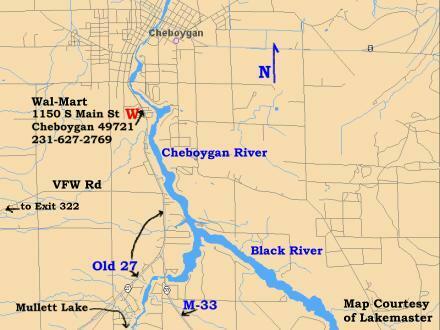 The 2006 Michigan BFL event at Burt/Mullett Lakes will have the pre-tournament meeting at the Wal-Mart in Cheboygan Michigan just North of Mullett Lake on Old-27/Main Street. As usual, registration is 4PM to 7PM. The meeting starts at 7:30PM. Try not to bring your boat. *From I-75, get off on exit 313 on Old 27 and go North until you see Wal-Mart on the left. Allow at least 20 minutes. *From Aloha State Park, take M-33 North to Old 27. Turn right/North onto Old 27. Watch for Wal-Mart on the left. *From Indian River, take M-68 into town and turn or go north on Old 27 at the market intersection through downtown. Follow until you get to the Southern edge of Cheboygan - Wal-Mart on the left. You can also get on I-75 North and take the exit 313 route. Give yourself 1/2 an hour. *Alternately, you can take I-75 North to exti 322 Riggsville Rd. Go right/East until you split at VFW Rd. Follow VFW Rd East/right until you come to Old 27. Go left/North on Old 27 to Wal-Mart. This may be a little faster. Watch out for deer!